One of the interesting aspects of the current International Polar Year that sets it apart from previous Polar Years is the number of research projects that integrate scientific research with traditional knowledge of indigenous communities that have inhabited the Arctic for thousands of years. One such project is the IPY EALÁT project (n°399), which is investigating how traditional reindeer herding societies in the Arctic are adapting to climate variability and change. The IPY project is part of the broader EALÁT project that also involves outreach and education to reindeer herders in Eurasia and Alaska. Initiated by the Association of World Reindeer Herders, the EALÁT project, which lasts from 2007 until 2011, brings together researchers from very diverse disciplines, from climate researchers to linguists. The project is coordinated by the Sámi University College in Kautokeino, Norway, under the direction of Professors Svein Mathiesen and Ole-Henrik Magga, while the International Centre for Reindeer Husbandry, which is also in Kautokeino, handles outreach and information. Reindeer husbandry has been practiced by numerous indigenous peoples all across Eurasia and Alaska for thousands of years. Having learned over generations to live sustainably in an Arctic environment, societies that practice traditional reindeer husbandry are good examples of human communities that are highly interconnected with the ecosystems in which they live. The name of the project, which comes from the word "pasture" in the Sámi language, reflects the emphasis of the project on the close connection these cultures have to the environment in which they live. Very little is known about how such highly interconnected systems can be affected by changes that are taking place in the Arctic ecosystem, which is why researchers found it important to get a more thorough understanding of indigenous knowledge and see if and how this knowledge can be integrated into natural science research focusing on climate change. Reindeer husbandry involves moving herds of reindeer, which are very docile animals, from pasture to pasture with the changing of the seasons. This means herders lead either a nomadic life living in a tent on the Arctic tundra year-round as a family unit, or a semi-nomadic life, living in permanent residences for parts of the year while only some family members herd on a daily basis. The number of reindeer in a given herd can be anywhere from 30 to 30,000. While the planners of the IPY EALÁT project had hoped to study five different reindeer herding societies across Eurasia, funding limitations forced researchers to concentrate on the two largest reindeer herding cultures in the world: the Sámi, who inhabit Northern Fennoscandia (with the Norwegian county of Finnmark representing the centre of the society), and the Nenets, who live in the Yamalo-Nenets Autonomous Region in Russia. A majority of the Sámi participate in the local cash economy (with at least one member of the family having a job that provides cash income) and live in tents only part of the year when reindeer herds must migrate, while a greater number of Nenets still live on the tundra year-round (although the number of nomadic Nenets has been decreasing). Motorised vehicles have made it possible for herders to live further away from their herds for parts of the year, visiting it daily or a few times a week, as needed. One of the main objectives of many of the seven research packages within the IPY EALÁT project is to document indigenous knowledge about snow conditions and their perceptions about how they are adapting to changing climatic conditions. A great deal of insight can be gained from centuries-old knowledge that herding societies such as the Sámi and the Nenets have to offer. With the number of traditional reindeer herders on the decline, it is important to document this knowledge as much as possible while it is still available. Anders Oskal, Director of the International Centre for Reindeer Husbandry, stressed the value of documenting this indigenous knowledge. "If you look at avalanche researchers for example, they have thorough knowledge about snow layers. But it's not even close to the same level of complexity as the language that reindeer herders have about snow and snow-related phenomena. 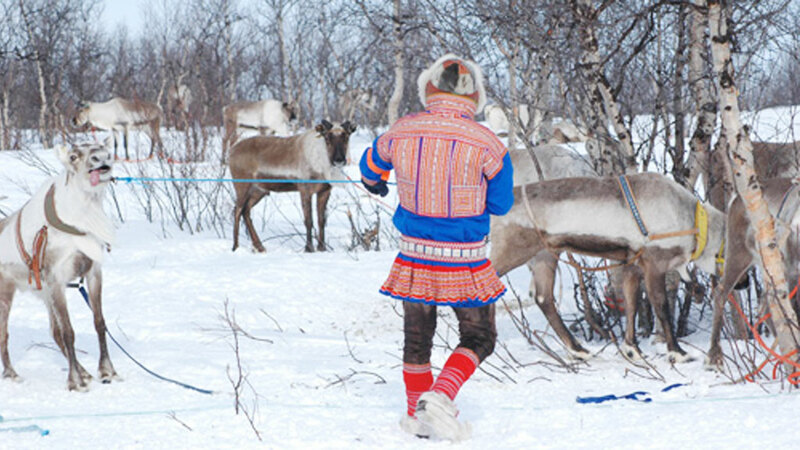 Sámi reindeer herders have over 200 analytical expressions for snow and snow change. This is knowledge that has been developed not by chance, but because it was necessary to survive under extremely challenging and constantly changing climatic conditions." Indigenous knowledge has always helped guide reindeer herders when migrating between the summer and winter pastures of their herds. However, one of the main tenets of the IPY EALÁT project is that indigenous knowledge can give insight to science, and science can give information to indigenous reindeer herding communities in return. Project members are carrying out field research to obtain data that can help reindeer herders adapt to adverse weather conditions and climate change, especially as climate change is making weather conditions more variable and less predictable than before. For example, the Sámi reindeer herders in northern Fennoscandia usually allow their reindeer to graze on the tundra in coastal areas during the summer months, where they can feast on abundant grasses, bushes, mushrooms and daffodils. After the annual slaughter and the first snowfall, the herders bring their reindeer to over-wintering pastures in the mountains and tundra in the interior part of upper Fennoscandia, where reindeer dig through the snow to reach lichens, the main food for reindeer during the winter. Yet certain meteorological conditions can sometimes create conditions that "lock out" winter grazing pastures. If a warm period partially melts the snow and is then followed by rain, once temperatures drop below freezing again, this can create a thick coating of ice on the surface of the winter pastures, which makes it impossible for reindeer to gain access their primary winter food source. This can lead to illness and starvation in the reindeer herds, which translates into losses for reindeer herders. Another important aim of the IPY EALÁT project is seeing if it would be possible to better predict when and where adverse winter grazing conditions might occur so that eventually a service could be set up that would help herders know where grazing conditions are bad so they can avoid those areas. Meteorologists from the Norwegian Meteorological Institute in Oslo have developed models that can predict snow conditions in Finnmark by looking at temperature gradients throughout the snow pack. But it is also important to get empirical data from the field to verify the predictions the models make. So in October 2007 a team of researchers from the Sámi University College installed thermochromes (devices that take consistent daily temperature readings) all over Finnmark at various depths between the ground and the top of the snow pack. In May 2008 a team will remove the thermochromes, and the temperatures they record will be compared with predictions the model has made. This process will be repeated for three more winters in order to get an adequate data set to compare with the model. Researchers are also examining meteorological data taken over the past several decades, concentrating in particular in years when many pastures were "locked out" due to thick ice cover. The Polar View consortium, which runs a variety of earth-observation services for its clients all over the world, will also be contributing to the study by providing researchers with snow maps created using satellite data. These maps help in giving an overview of the amount of snow cover and snow cover type (whether it's wet or dry) in the regions being studied in the EALÁT project. "We're trying to get a better idea of the snow temperature from the ground to the surface of the snow pack because we know very little about what the temperature of the ground does to the snow above it," said Philip Burgess, a member of the team handling communication and outreach for the EALÁT project. "If you have warming on the ground, what will happen to the snow above it? Will it get wetter? Will it get drier? It's important to know how the energy exchange between the ground and the snow above it functions so we can get a better understanding of how we arrive at certain snow conditions." While this particular part of the research project is just getting underway, Burgess feels that this will be one of the most useful aspects of the EALÁT project to reindeer herders. "We hope that with very accurate temperature measurements in the snow taken over several winters, along with satellite data and computer modelling, we will be able to predict whether a certain area is going to have pastures that are completely 'locked out' so we can tell the reindeer herders to avoid that area." In addition to this very ambitious work plan, the IPY EALÁT project is also doing research into the effects that climatic change and variation might be having on reindeer's nutrition and the fertility rate of female reindeer. On the social science side, one work package is investigating to what extent societal structures such as government and international institutions either help or hinder reindeer herders in adapting to climate change. Any information learned from the IPY EALÁT project will be diffused to reindeer herders in six reindeer herding communities from Fennoscandia, Russia and Alaska (including the Sámi and the Nenets) in an education and outreach effort that is also part of the broader EALÁT project. One integral part of this outreach is building a web-based portal for communication of relevant information related to circumpolar reindeer husbandry. Indigenous knowledge can give insight to science, and science can give information to indigenous reindeer herding communities.